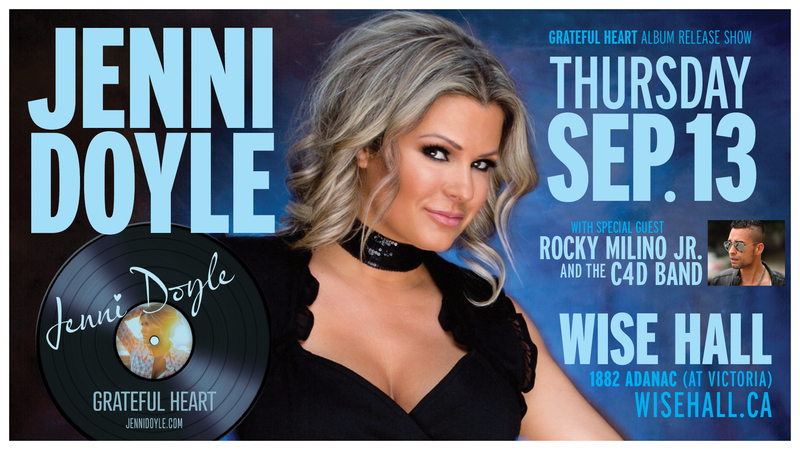 Jenni Doyle will be releasing her new album entitled “Grateful Heart” at the Wise Hall in Vancouver on Thursday September 13th. She will be sharing the stage with some amazing and extremely talented musicians. Allan Rodger on keys, Rocky Jr. Milino on guitar, Gord Maxwell on bass, Mike Sanyshyn on fiddle, Mike “Machine” Mallias on drums also the beautiful voices of Steven Lane and Tota Mendez to back her up. Rocky Milino Jr. and the C4D band will be opening the show with a high energy, boot stomping performance with Chris Nagle on bass, Mike Mallias on drums and Allan Rodger on keys. Jenni’s music video “Only One Cook” will be debuted as well as some more surprises! Doors open at 7:30pm and shows at 8pm. Cash bar. $20 pre tickets available from www.brownpapertickets.com or Jenni or Rocky! $25 at the door.